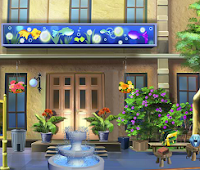 FirstEscapeGames - FEG Escape Game: Fish Shop Escape is another point and click escape game developed by First Escape Games. Assume that you went to a fish shop to buy a fish tank along with your daughter. You were very busy with your shopping that you left your daughter at the shop and came back home. After coming home, you realized that your daughter is missing and you went back to the shop to find your daughter, but the shop was closed. Now you need to get into the shop and rescue your daughter by finding the key. Solve puzzles and use objects to get your daughter back. Good luck and have fun! it's great fun to give hints or to ask other players for help, when stuck! Pole won't let me zoom to attach "things" so I can't go further. One star as is 4 star if fixed and rest of game works. Lots of stuff to do. I'll hold my rating for a bit to see if they can fix the issue. first use pole under cupboard (room with teddy beat on chair). After this you can zoom and attach the magnet and red rope. Batteries will go in remote. You need lighter for candles. Fire hydrant gives you sneaky object (bottom to the right). No idea what to do with the fire hydrant and only have half a key. ! When the water pours from the hydrant, look for zipper part at the very bottom of the scene.